The many ways Americans already pay for universal health care -- but don't have it. "Are you crazy? A government health care system would be a bureaucratic nightmare!" The many ways Americans already pay for a universal health care -- but don't have it. Health care insurance is primarily provided by the private sector, generally through a group insurance plans negotiated with an employer, of which the employee pays an average of 27%. Then, of course as any accountant can tell you, those costs are expensed by the employer as a cost of doing business and recouped through pricing on goods and services. Therefore, every time you put out your hard earned dollar for anything, you are paying for someone’s health insurance. In fact, you are paying for many people’s health insurance on all the tiers of costs incurred as any product travels on the journey from raw materials to producer, from producer to middleman, from middleman to provider, from provider to the public. At each level, health insurance costs are part of the total cost. Pretend you’re the owner of one of those few U.S. industries still operating in the manufacturing sector. The average cost of insuring each employee is $9,580 per year. If you have 100 employees, your prices must be high enough to recoup $958,000 annually, and for 1,000 employees $9,580,000 annually and so forth. And don’t forget that buried in the cost of any component of whatever it is you’re making, are the health insurance costs of those that produced it. (Assuming it is American made; which it most likely isn’t, because it’s too expensive to make things here, but let’s pretend.) But out there, in the market place, you are in competition on a global basis with foreign manufacturers who are not held responsible for their employees’ health insurance costs. 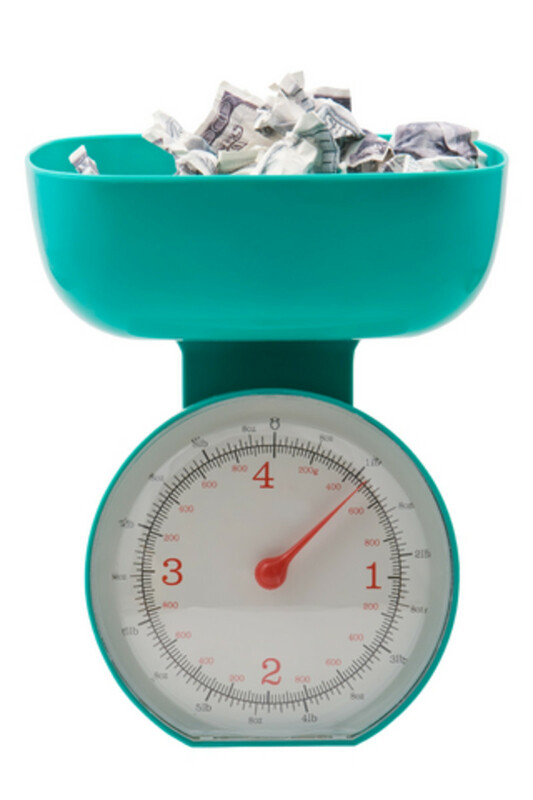 In order to remain competitive, you must cut your expenses. So Mr. or Ms. Business Owner, what will be your first choice of costs to eliminate? Do you think this might have something to do with the choice to manufacture overseas? You, the employees are paying an average of 27% of your own health insurance, as well as your deductible, as well as your co-pay portion. This 27% is a major reduction of your take home pay, an amount that doesn’t go very far in this day and age. So, you decide to visit the doctor only when you’re truly ill, and forgo those screening and preventative care visits even though you’re insured because those co-pays add up, and have to come out of your grocery budget, or you’ll have to sacrifice cable TV and the kids will drive you crazy then. So it seems like an intelligent decision at the time. Until you require major critical care for a condition that could have been detected and treated had it been caught earlier, and you’re suddenly responsible for 20% of some staggering costs, plus that deductible. And find yourself uninsurable afterward. But even if you’re lucky, and stay in good health, the premium costs are continually climbing. Why? Because the cost of health services is continually increasing. Why? Because more and more Americans can no longer afford the premiums, but still get sick and show up at the hospitals, which are morally bound to treat them. After all, we can’t have people dying in the street like abandoned dogs, can we? A civilized society doesn’t do that. Oh, by the way, the common myth that operating deficits in hospitals are due largely to the illegal aliens showing up for free care can be debunked right here. In the states with highest concentrations of illegal immigrants – Texas and California, non-documented aliens account for no more than 14% of those receiving non-insured care. Naturally, the hospital has to recoup those costs – the ones they can’t squeeze out of the sick you, or your working wife/husband, or the equity in your home, or all of your savings, or your 401K. And they do that by spreading the cost of treating those who can’t pay but don’t qualify for public assistance, to those that can pay and their insurance carriers. Then, naturally enough, the insurance carriers charge more for the premiums to cover that increased cost, which means that more Americans can no longer afford to pay for health care insurance. This, I believe is called a vicious circle. Of course, they must. They are in business to make a profit, not to pay for medical care and making a profit is a tough thing to do. Isn’t it? * Ron Williams - Aetna - Total Compensation: $24,300,112. * H. Edward Hanway - CIGNA - Total Compensation: $12,236,740. * Angela Braly - WellPoint - Total Compensation: $9,844,212. * Dale Wolf - Coventry Health Care - Total Compensation: $9,047,469. * Michael Neidorff - Centene - Total Compensation: $8,774,483. * James Carlson - AMERIGROUP - Total Compensation: $5,292,546. * Michael McCallister - Humana - Total Compensation: $4,764,309. * Jay Gellert - Health Net - Total Compensation: $4,425,355. * Richard Barasch - Universal American - Total Compensation: $3,503,702. * Stephen Hemsley - UnitedHealth Group - Total Compensation: $3,241,042. Yep, it sure must be hard to make those profits. The trick to these profits? Get rid of any sick people on your list, and get rid of the ones who are at risk for being sick. Those 65 or older get Medicare, paid for by taxes. The poor and medically needy, get Medicaid, paid for by taxes. Those at highest risk, the military, get Veteran’s Administration, paid for by taxes. Children of low income families get CHIP, paid for by taxes. Those above the means test for Medicaid but below whatever each state (and sometimes county) elects as a limit, usually 150% of the poverty level, get Country paid discounts for health care, paid for by taxes. And then, those employed by the Governments – Federal, State, County, and City or Town all get health insurance paid for by taxes, (but upon research this writer found those tax dollars go to the private insurance companies.) If you add up all the health care already paid by taxes, research shows that between 50-60% of the population is already covered. Now add to this COBRA, that vehicle that was supposed to assist the newly unemployed maintain their insurance. Not only did these newly unemployed suddenly find their premiums escalating, the government chose to pay 67% of Cobra fees rather than put these people on Medicare. Now, as most of these people were in the lower risk categories, the cost to the taxpayer might have been next to nothing, relatively speaking, but instead the insurance companies are getting hundreds and hundreds of dollars each month, per person out of what can only be called a publicly funded subsidy. Now add to that 50 states, each administering Medicaid, Medicare, Chip, SSI, SSP, County programs, City programs, none of them managed concurrently and all requiring their private fiefdoms. Next, add the cost of accounting for all the veterans receiving medical benefits from Veterans Affairs. All this duplication of administration -- this waste -- does nothing to assist in anyone’s health care yet, is included in the calculated cost of keeping the American public 42nd in the world for health care and longevity (just behind Chile 35th and Cuba 37th, and 72nd in overall health. In order to cope with all this myriad of administrations, doctors and hospitals must maintain costly administrative staffs and systems to deal with this amazing, mind boggling bureaucracy. Combine these two, and all this needless administration consumes one-third of America’s health dollars. 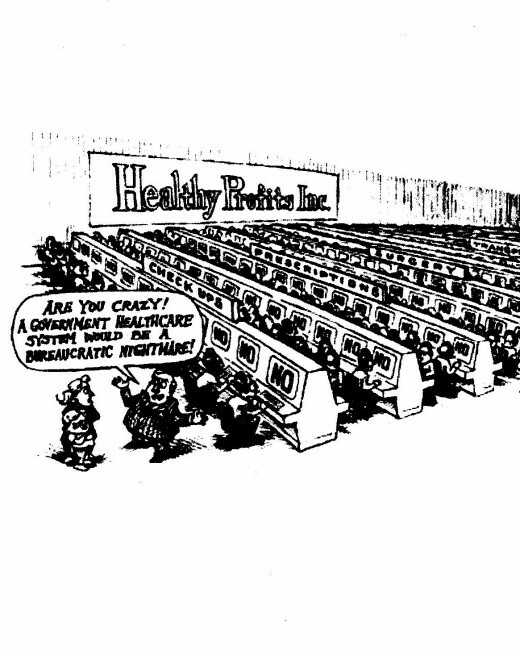 This past year, with the proposed (but failing) overhaul to the American health care industry, the insurers and drug makers have increased their lobbying efforts in order to protect their bottomless rice bowls. The lobbyists flocked to Washington bearing their gifts. Here are some interesting numbers. The Blue Cross and Blue Shield Association upped its lobbying expenditures to $2.8 million dollars; GlaxoSmithKline proffered $2.3 million; Novartis’ largess was $1.8 million; MetlifeGroup not to be outdone spread $1.7 million around the capitol, and Allstate $1.5 million. Johnson & Johnson had $1.6 million in their bag of goodies; America’s Health Insurance threw $2 million at your representatives, and Bayer wasn’t far behind. PhRMA spent $8.6 million in the first half of 2008, and report spending less this year by $700,000. And the doctors, who one would normally think would love to see an end to this chaos, spent $8.2 million in the first part of this year alone. Overall, the health care industry and their pet lobbyists spent money at the rate of $1.4 million a day. Now guess who is paying for that – I dare you. As more Americans each year are faced with crippling health care costs in the face of higher deductibles, or loss of insurance along with their jobs, and declare bankruptcy, but only after depleting their savings and pension funds, what will the future hold for those who approach their retirement years without the assets to support themselves? The baby-boomers -- that unnatural hump in the population’s demographics -- are approaching their late middle to late years with fewer resources than the previous two generations before them. This can only be a further drain on the nation’s resources. The insurance companies tier their premium price to employers on such risk factors as age and previous illness – and the premium for someone aged 50 to 60 is three times higher than for those twenty to thirty years their junior who work in the same business. Doesn’t this motivate companies to sacrifice their loyal, long term employees to the bottom line? Age discrimination – illegal, but common practice. Companies are refusing to insure their workers, resorting to hiring an assortment of part-time employees to avoid the issue. In the state of California, where the government is attempting to legislate mandatory coverage for employees, companies are downsizing to avoid the hefty cost. And as 50-60% of the population is already covered by health care paid by the tax payer, the working uninsured are paying through their payroll deductions and taxes for health insurance in which they are unable to participate. For the younger adult population – what is ahead of them? 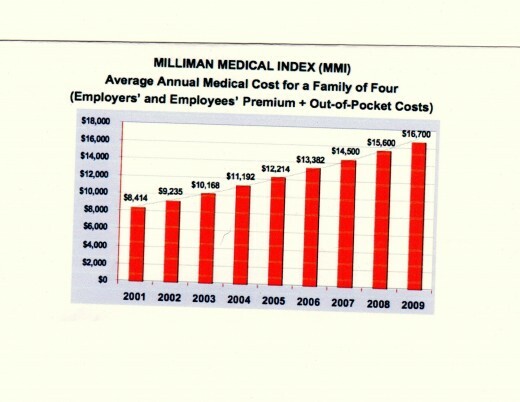 According to the Milliman Medical Index (MMI), the average annual medical cost for a family of four, (employers and employees premium, and out of pocket expenses), was $8,414 in 2001, and $9,235 in 2002. By 2006 it was $13,382 and in 2008 it is $15,600 and this year, 2009 $16,700. If this trend continues, this cost index will stand at $18,000 in 2010 – doubled in ten years. If we extrapolate the trend for another decade, America’s health system will extort $36,000 dollars per family of four. The average mean wage in the U.S. for 2008 was $42,000. The average mean household income for a family is $60,000. Add in benefits, employee and employer portions and we arrive at the figure known as gross wage base – something accountants consider all those entries that go in to the account ‘Payroll,’ and it is from this the entire MMI is funded. Over the past decade, salaries have grown at around 3% annually (for those still working.) This growth rate in wages is unlikely to increase. This means that in another ten years, health care will consume between 44% and 50% of the wage base of this family of four. Millions and millions more families will find themselves joining the 47 million Americans without medical insurance. NEW! Is the Affordable Care Act Affordable? 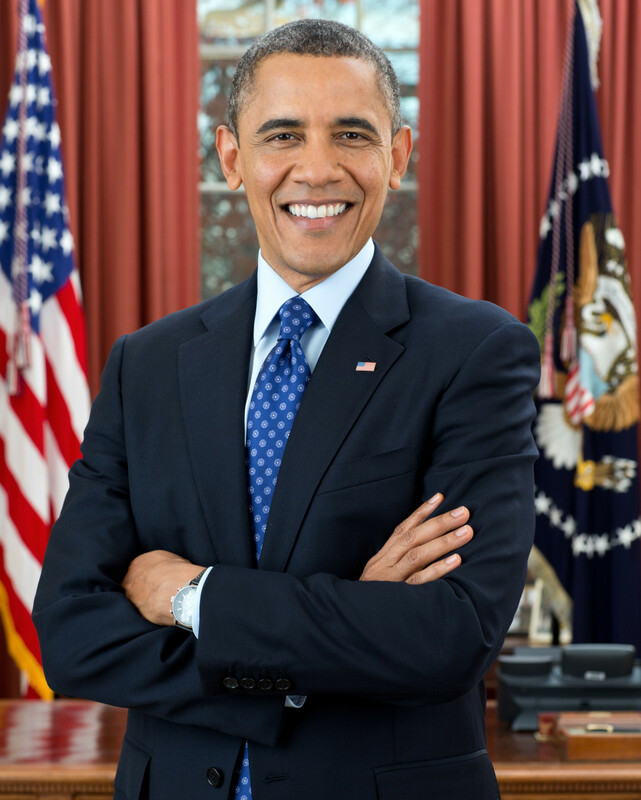 Is the Affordable Health Care Act Affordable? Is the Affordable Health Care Act truly affordable? A sharing of one person's experience. Thanks Don. You may want to check out my new hub: Is the Affordable Care Act Affordable? And you're right -- but rather than dodge ball it's more like pig-in-the-middle. Thanks for commenting. Thanks for an informative HUB. Have you considered a rewrite given all the new material about US healthcare over the last few years? Given all the culprits in this fiasco, why do US citizens feel like the guy in the middle of a dodge ball tease. Politicals, insurance companies, the drug industry, Doctors, expensive hospitals, biased media all having their way with us. Thank you Susan, and welcome to Hubpages. I'll be by to read your article on this subject soon. I'm new here, and one of my first hubs was about universal health care and the hidden costs of our current health care system. I didn't come anywhere close to explaining the excesses as you did here. The truth is, we could provide at least basic primary and preventative services funded by taxes for far less than we're paying now if we started cutting out the waste. Excellent hub, one of the best I've read since I've been here. I've just come across this hub although it has been up there for some time. I came across it via some other hubs (financial)and I'm very glad I did. I've Known for some time that the American Health System was in a bad way but, I did not know it was as bad as you explain it. First I am English but am retired to Spain for Climatic and Financial reasons. I have lived in Spain for ten years now. Since I have lived here I have only ever been to see the doctor once for an Eye infection. The cost ZERO. We both have Spanish health cards and also an EU wide health card. I met an American man in a place called Santa Pola who has a Spanish wife and they had just moved from America to Spain. He had now been here for six months. He was “Over the Moon”, about the place, he said that after living in America all his life he could not get over the way things are so laid back over here and also that the health care was free at the point of entry. From the way you explain the health care's financial captivity and the way that the media and the politicians are in some ways financially involved then the only way to change it is to have to wait until the financial system gets so greedy (and it will, being left to it's own devices) the the whole “House of Financial Cards” will come tumbling down. There are trillions and trillions of dollars all leveraged into derivatives, More money than there is in the whole World. When that happens, you will be able to start over again and, hopefully get together an Altruistic sort of governance. But I know it's coming. Sigh! llmartin. As ugly Americans - we refuse to see. We refuse to see our own ugliness. Despite your extremely informative hub. When I met Canadians while working in S. Korea - they just could not believe what we did not have in the way of healthcare. S. Korea provided far more for me in very high quality, low-cost healthcare, with paid maternity benefits, as soon as I got there. Something the US does not. Living in England, they could not believe that we had no benefits at all as a human right. None. The secret to having this corrupt expensive medical system - the biggest pushers are the big pharmaceutical companies giving us cheap toxic drugs at premium prices - is to keep the fools (Americans) divided and conquered - it is so easy. A time tested system. It is true that we spend more on medical care and research than any other country on earth - yet we rank 49 in healthcare (we are sneaky enough not to say 49 out of what - 50?) So if we do the math - Africa is usually discounted - and that is 53 separate nations right there so we are 49th out of how many other countries? What countries? And it is a fact that CEOs of insurance companies make a fortune. (Thanks for the list) But why? But we are Americans - and nothing more than consumers - sell us anything - even the worst healthcare on earth, while we remain the fattest and sickest people on earth with longevity declining - and we will defend it. We think 'golly for every disease we have a magic drug' - forgetting that the disease is designed to fit the drug - of which there are so many now. And let me add to that - that a woman here must take a vow of abject poverty when she becomes pregnant because she neither receives paid maternity benefits nor guaranteed (quality) medical care for herself or her child. What other country allows this? Of course I am not an advocate of the toxic medical system we have right now - which maims and disables - but adding a nutritional component would make the difference. It is appalling that my elders used to live to be 100 and now folks are dropping in their 40-60s of diseases that never existed before. And all under a doctor's care while taking prescribed toxic drugs. Why wouldn't we want to change this? I've lived and worked in many other cultures in my long life - and what we put up with here as far as toxic and pricey medical care, high paid CEOs, chronic ailments, etc, no other culture would allow. They would demand change. Ah, I can go on and on - but what's the point. Americans are hardly the intellects of the world. We think as individuals and not as a nation (well-divided and well-conquered) - in other words "I got mine - so the rest of you if you don't, even if you are the majority, well, it is your fault." Not the fault of a corrupt system. Yes, blame the victim not the monster. It is hard for us to challenge this medical system because we have no idea what is going on - just what this multi-billion dollar industry tells us. My final words - let the culling continue. Maybe it is time to get rid of some stupid Americans. I know enough to stay far away from this medical profession - and to keep my family away. I research and write a lot about healthy eating and living, and taking care of yourself, and maybe that will help - but I doubt it. No, we want the magic pill eve if it kills us. Thanks a million for your hard work. Rated up. I cannot help but wonder why Americans would not be as capable as other people in other countries, when it comes to running an efficient single payer medical system. After all, that is what you're implying. Yes of course, people are needed to administer any kind of medical system -- but not as many, as you are not replicating services. One bureaucratic empire is better than two hundred. And about that druggy -- you're already paying for him. As stated by Immartin "I don't think we will ever see eye to eye on this issue." I guess this is how Wars start when one person from two different cultures can not find common ground and think their way is the only way. Sorry you could not get health insurance in our country. I agree their has to be change. But people need to take ownership and control of their health insurance. The core problems need to be dealth with before we give a blank check to everyone. As an example; Many of us that work our butts off 50 to 70 hours a week have no desire to have to foot a druggy's hospital bill for the rest of their life or take care of illegial aliens that do not pay any taxes. (I note your accounting background) and your article quotes many statistics, which is very interesting. However many of those jobs and postitions and staffing will still be needed as the infrastructure to service a national health insurance program. In doing so, many of those jobs and costs you describe would then be taken on by government employees who you can't fire and work at the pace of a snail going uphill, which then adds in another problem. Insurance Menthor, I have read your article and left my comment there. The problems you mention do need to be addressed but are a drop in the ocean in the real waste of the existing system. Having read your article, I know we will never see eye to eye on this issue, but enjoyed your thoughts, and appreciate you reading my hub. I hope you come back and read more, and I will drop in on you from time to time. Have read all the above comments. If you get a chance, click on my Hub page and read the reasons we have all these problems. Until we solve the core problems, there will never be a reasonable financial solution for any of us, except higher tax's and higher health care costs. Does every doctor need to build their own health clinic? Malpractice, fraud, overbilling, double billing, unneeded tests by doctors and no one is accountable and no body wants to take ownership of the core issues. If government wants to do something, they need to establish regulations to control these core issues. Yes, we need health care reform. But Just making it availabale to everybody without taking care of the core problems like malpractice, double billing, fraud, Non-universal Doctor billing forms, doctors sending bills to insurance company's and the people who don't care what is on the bill as long as it gets paid are the problem. Malpractice lawsuits, with no limits by attorneys, is the biggest problem we have today. And it is not even talked about in this health care reform. Is this number one problem even addressed in this health care reform...NO. Why..Just Look at who these senators and congess people are. No matter what plan they decide on, unless these isssues are fixed, premiums will go up or your taxes will go up because there is no one taking ownership of these problems..
Have a Happy Day. Life is Good, but would be way better if we could get these politicians to start living in our world and not theirs. Oh Yes and if they had any commom sense or business sense, that would be good to.. Thanks ColdWarBaby for the link and I will look it up. Why don't you email me with some points on the subject? Hi Duchess, Thanks for dropping by. I have to say, (yet again) that the American health care system, as it exists, makes no sense to me at all. It's expensive, redundant, overburdened in administrative bureaucracy, and even when in place, leaves families financially devastated. Yet the choler, the sarcasm and the extreme views express by some on the subject (you should see my email inbox) suggests, there are some that take it as a religious/political issue, instead of plain old health care. Who can figure? Immartin, once again great information, well researched, well written and so close to home for so many. It's very sad to hear some of these stories. Kudos for saying like you see it my friend! I promise you, the planned failure is no theory. By all means, think about it and apply your research skills. I'll bet you could come up with an excellent piece on the subject. Thanks Nan for dropping by, and you are right something needs to be done. But until the majority (and I believe it is the majority that wants change) flexes its muscles and demands the change, I don't know what will be done. Thank you ColdWarBaby, for visiting my hub. I'm appalled at the outright lies and distortions to be found everywhere I look on this issue. I'm also moved to tears by the number of people who have contacted me and shared their sad stories of ruin due to inadequate health care protection. Thank you for your analysis of the situation here and on my other health care hub. But no, I don't believe Canadians will allow the same situation to exist there. Anyone attempting to take away that health care plan will find their arm cut off at the shoulder and their political aspirations in ashes. You don't know us. We have you all fooled into thinking we're ever so peaceful. I am particularly intrigued by your theory of deliberate planned failure of government programs. It makes sense and gives me lots to think about. Immartin...Your dedication to research and accuracy make your writing an invaluable source of information and inspiration. The situation you describe evolving in canada shows an alarming tendency to mimic what has taken place in amerika. The government has been privatized. As a result, public programs are sabotaged through underfunding, under-staffing and are hindered at every opportunity. The profiteers then point to the "failure" of government programs as a justification for privatizing those services for profit. It probably won't be all that much longer before our military becomes a private corporation. It is always the fanatics and those hopelessly indoctrinated, even if their numbers are fewer, whose voices are the loudest. In their rabid defense of the indefensible, they shout down, attempt to intimidate, threaten and cast away any pretense at reason. When they can finally no longer justify their ideology with lies, they simply resort to force. They are the brethren of those who burned witches at the stake, who lynched black men just because they were black and who cannot tolerate the truth unless they have created it out of whole cloth or had it spoon-fed to them by their masters. They have caused much suffering and death throughout history and will continue to do so for the foreseeable future. But they will not prevail. Ultimately, even if it means the extinction of our species, nature will weed them out. We have an awful problem in providing health care for the citizens in the US. I think that you did a good with your stats. The real reason is that the executive are being paid too much money. They are not worth that much money. In the first place they are not doing all the work, their staff are the people doing the work. It is a runaway corporate greed that is taking place. They don't want the government to take over, because they will not be able to draw these outrageous salaries. Keep in mind that the people didn't like social security at first, its government run. We are bound to end up with the government running some of the programs for health care. Insurance companies had to be bailed out and they don't care about the average citizen. Hilary Clinton tried to get government run health care and could not. Something has to be done for the average and poor in the US. Your article is a light for everyone to see the truth! Hi Amanda, Yes the history of the Canadian health care system is a study in how a populace can make the changes it wants despite major obstacles against them. And for all that Canadians have a reputation for being polite, peaceful and respectful, almost a bland, boring type of society, in truth we are perhaps one of the most bullheaded, stubborn people on the face of the earth. Riled – Canadians are truly a force of nature. Look at the history of labour unions in that country. Look at the fate of anyone who tries to take our health care away. Unfortunately, since the 1960’s, when Tommy Douglas was elected as Premier of Saskatchewan under the Social Credit party and our medical system was born, the change in the nature of Canadian Govt., particularly during the 1990’s meant that funding was cut and services were starved for funds. This was primarily a Conservative Party decade and they would have felt right at home in Washington. At the same time, immigration expanded at an unheard of rate – planned to compensate for Canada’s zero population growth (thanks to family planning.) So, with the increase of demands on an underfunded system, waiting times increased. One should understand, it wasn’t just the medical system that became overburdened, it was all systems – not enough hospitals & doctors, but also not enough schools, not enough police, not enough courts, not enough roads – everything. Our population increased by 1/3 and funding for the systems decreased by even more – at the same time. One of the proposals now considered is to consider a two-tier medical system, with services still provided under our universal system, but with pay for services for those that can afford them. Immediately, the big insurance companies looked greedily across the border and envisioned enslaving us the same way they have enslaved the U.S. Thus began the propaganda campaigns to discredit our universal health system. Now, I note that many Canadians are writing of frustrations with the system, and I truly understand that. We have seen our care degenerate considerably from a shining beacon of success to the world, to one that causes concern for those waiting for tests and non-life threatening care. What I fear is the implementation of two systems – slow and underfunded care for those that cannot afford private coverage, and timely all encompassing care for those that have money. It would be, to quote our American friends “the first step on a slippery slope” to for profit medicine. I can honestly say I have had excellent care all my life in Canada. After a several month work/study program in West Africa, I fell very ill. I was still in Togo – an impoverished little country on the Gulf of Benin in West Africa that has nothing but rudimentary first aid stations to offer the ill. An army medic shot me full of morphine and put me on a plane to Paris. I was still feeling pretty good on the morphine (such a wonderful drug) and a little concerned about applying for assistance in France, so when I saw Air Canada at the airport – and I was never so happy to see that beautiful red maple leaf in all my life – I got myself home. I travelled from Mirabelle airport in Quebec to the Montreal Jewish General Hospital by ambulance, found myself slapped into strict quarantine (an unearthly experience when everyone who comes into contact with you is wearing the equivalent of space suits) but when tests showed just garden variety Dengue Fever and a form of Typhus and the usual assortment of intestinal parasites, I was treated – in a province where I didn’t have insurance – it was billed to my home province. This is just one example. Another is when I slipped on some ice and fell down some concrete steps, injuring my spine. I had an MRI that night and surgery the next day and that was only three years ago. What would have happened to me here? Even if I was covered – and that is doubtful and for all of you who don’t know this, as part of my research into U.S. health care, I recently applied for health insurance and am waiting for their decision – I would end up with massive bills for the co-pay. I truly fear for the future of our medical system – because the continuing propaganda attacks are now beginning to convince some Canadians that private is the way to go. And also, such a large percentage of our population is now from elsewhere, with no understanding of how hard fought our right to care was, and it is a human right in Canada. And also the younger generations take it very much for granted. But I know in my heart, eventually Canadians will put up such a fight the situation will be rectified. It is already beginning to happen. We need only look south of our border to see what a mess awaits us if we don’t fight back. That’s one of the reasons I am researching this problem – for publication in Canada, as well as joining the good fight here in my unofficially adopted second home. The U.S. considers health care an industry – a credit entry (income) on the books of the GNP (gross national product.) In truth, health care is a debit (expense) to a nation and should be treated as such. Human lives are not raw materials for a productive industry; they are the first obligation to any governing body – otherwise it is not a government of the people; it is a government of industry. I take on board your response to my comment. Of course everyone in America is paying for health-care whether they receive it or not. That makes perfect sense. I guess that I was coming from the angle that there are two ends to a tangled thread, and if you can't untangle it from one end, perhaps it's good to start at the other, and see how far you can get before cutting the really knotty bit loose, and accepting the loss. Thank you, Martyjay for reading my hub, and for confirming my research through your own firsthand experience with the real accounting and cost of the existing programs. And is only 50% coverage really worth anything? Not with today's cost of health treatment. 50% will still wipe out a family. You are right. The people in this great country need to recapture the spirit of independent thought, and stop accepting that which the TV feeds them as true and real. You have without a doubt captured the root of the problem. Many Americans, meaning those which live in the U.S., do not understand that they are already paying for the medical insurance of others. For instance, I worked for a fortune 500 company which covered 50% of my medical insurance costs. I also worked in the accounting end of the business. The 50% of the medical cost expensed by the company was included in the product cost plus 10% for administration. These expenses were then passed on to the consumer. Therefore everyone who purchased their product paid for the employees insurance plus cover the corporate overhead. I hope that we as Americans have not lost the ability to analyize and critize what we hear through the media. The misinformation spread through the media has heightened over the past 15 years. Why? It is because we fail to think for ourselves. Thank you for thinking for us. Thank you pseudonymous. I quite agree. It is a shameful situation and one that is not understood. Were it, I think the people would demand change. Thank you for reading this hub, and I hope you come back to read more. Fantastic hub! It's great to see a reasoned retort to all the lies that are being put around about healthcare reform. As I'm sure has been said here before, the fact is that Americans pay (much) more for less - less coverage, less care and less piece of mind. It's about time someone made it a priority to fix this. Immartin--I personally am at that 'aw screw it' point already, but he isn't, and I understand that. It's hard to see your whole life of hard work about to be flushed due to bad luck and an inhumane health care system and central government, but so many of us have been through just that or are soon to go through it. It will be scary if he loses his job over this, but just like it was for me in 2008, the job is probably causing a lot of it. Not all of it, but much of it. He didn't used to work 14 hour days in a city an hour and a half away. Like so many, his local workplace was closed and layoffs were made down to a skeleton crew. The 'lucky' ones who are left get worked to death, literally. Thanks for the good wishes everyone. We will come through somehow but, yes, it's very scary. I just told the story because sometimes I think real stories from real people illustrate how nuts health care is in the U.S. better than figures and facts. But I still really, really appreciate all the research that you put into gathering these facts and statistics and writing them up! Thank you again. I think what you went through with your mother-in-law is the next big crisis. It isn't talked about much if at all, but as the population ages and there are few social services and only badly paid work, it will be very serious here. Well, it is already. I'm so sorry you had to go through that, but it sounds like she was fortunate to have both of you in her life. I get so sick of the BS political positions. People should 'work' for their health care. We've both worked hard all our lives. When we need the care what do we get for our hard work? Screwed. No Rose, you are very clever. And did you notice, I didn't once mention other systems. I think the problem is the mouthpieces of those that gain the most from the status quo (ie Limbaugh, Beck etc.) have the uninformed, uneducated, and unquestioning gullible public terrified that somehow they will lose their freedom, if universal health care is adopted -- or any of a number of changes. Thanks so much for dropping by and reading my hub. I hope you come back. I've read an awful lot of logic, common sense, and well-reasoned arguments about health-care on these pages (and on the pages of some of the commentators above), but the problem seems to stem from some people's (well, a lot of people's) fundamental belief that "this just isn't how we do things here". No amount of comparison with the great systems of France or Canada or the UK will convince someone who has a deep-seated suspicion of all things "other". I honestly don't know how to get round this other than to simply stop telling people that the American system needs to be more like those above and simply market the whole thing as a fantastic new American invention! Or am I just very, very cynical and bad?? Kartika, if she has let lapse her medical insurance in Canada, she only needs to wait three months to be eligible, not several. And she would be well advised to do it, under her circumstances. Please tell her this. And if she has noone to go to there, let me know privately. I will put her touch with people who can help. Once again, lmmartin, brilliant job! Thanks so much for doing the extensive work and research to get out these facts - I learned a great deal. Pgrundy, my heart also goes out to you - you are in the middle of this mess and affected on all levels! My son lives in CA and his girlfriend, who is Canadian but has lived here for years - had a foot injury when she was in the film industry - the actors insurance fund covered this for a period of time and then the insurance ran out - now she is in continuous pain with vertigo, has re-injured her foot (originally she was in a wheel chair for a year and they thought she might never walk)- if she goes back to Canada, she has to wait several months to become eligible again for free health care, I'm told, and currently has no money or family there that is able to help her - my son is recently out of work and trying to scrape money together to get her medical care - she needs thousands of dollars worth including an MRI - that is what they told her last week when they went to the emergency room. They are living a nightmare also and it is truly heartbreaking to see so many affected by the same scenario in different ways. Thank you for telling your story! Again lmmartin, thank you for continuing the process of educating the public on the issue - this needs to get published elsewhere as well! Hi Amanda, Health care co-operatives -- OMG, my dear what a socialist thought! Yes it is a lovely thought -- but you will still be paying for health care for 50-60% of the nation through taxes and every single dollar you spend. So doesn't it make sense to demand change to the existing system? I don't know if you've ever heard the term "the silent majority" but it seems to me that is the real problem. The majority is silent, letting the blowhards (who are paid magnificent amounts) pretend they speak for the country. Why is it tolerated? Because "we, the people", let them get away with it. An underground alternative system will alleviate some problems for a few, but not the over-all. I agree that alternative care and healthy living would be of benefit to everyone. But the system will still continue in all of its foolishness, and you will continue to pay for it. Immartin, another brilliantly researched hub. The question that occurs to me when reading the many hubs about American healthcare, is, why is this situation tolerated? Why are there not health-care co-operatives being set up within communities? If people band together and approach health clinics with not-for-profit schemes funded by those who cannot afford insurance any other way, surely the clinics would be receptive? A while ago I wrote a hub about alternative currencies, and I included a reference to New York's Ithaca Hours scheme as a foot-note. Recently I re-visited that site and found that they have a scheme for accessing health-care using the alternative currency. I don't know if this is quite what I visualised, but if it exists in New York, might it not be viable elsewhere? I think we need more alternative's to the present medical treatments being provided,like preventitive healthcare on a quarterly basis to try to keep us healthy through diet and suppliments before we get to the point of no return.If we haven't already. No Gus, not my calculator my fingers. At first I had too many zeros thanks to the tremors in my hands, then took out too many. But thanks. lmmartin - 1 x 9580 = 9580, 100 x 9580 = 958,000, and 1000 x 9580 = 9,580,000. Your calculator may need a new battery. My heart goes out to you. Stressing over health bills causes many people not to heal while contemplating the true cost of getting sick in America. It makes you wonder what the whole point is in having health insurance at all, if you are discarded because you are ill. What he really needs is time to rest, without all the worry, but of course he will not get it. My mother-in-law paid for medical insurance all her life, then, just when she needed it most, her carrier, OATH, went bankrupt. We brought her up to Canada to care for her in our home, but she didn't qualify for Alberta Health -- for obvious reasons. She was in the country illegally. But the compassionate Alberta social services network still provided us with much assistance, including govt. paid home care (all free to us and considered a necessary service to me, to protect my health.) Doctors also found ways to help her without charging us the full care. But eventually we had to return her to a care home in Louisiana once she was strong enough. Medicare covered some of her costs, but not the cost of her daily care. Her puny pension income was considered by Medicaid as over the limit for the means test and she was refused. The state absolutely refused cover any of her costs, even though she'd paid for health insurance, paid her taxes, worked hard all her life. She lived for another decade, and my husband and I had to foot her bill, depleting our own resources considerably. So the American health care system managed to screw us, even though we were living in Canada. When my husband first moved to Canada, he had the usual U.S. mind set of universal medicine as a socialist evil. His attitude is completely changed after seeing it in action, and the level of care we received when required. In fact, the one thing that causes him pause about our retiring to Florida is this whole health care mess. I truly do not understand this debate. I hear such stupidity as it is debated. One bigwig from Texas just said that widening the means test for CHIP as a vehicle to ensure some of the 80,000 children in one county in Texas without health insurance was "the first step on the slippery slope to socialized medicine." God save us from such ignorance. His political ideology is more important the 80,000 in the county he represents. When something is not working, more of the same will not help. That is just common sense. But there are those the use any excuse to protect the status quo and their perks that come with it, by using the basest of propaganda and playing on the fears of the uninformed. If your partner continues to suffer and worry, just say screw it. Forget about it. As Janis Joplin used to sing, "Freedom's just another word for nothing left to lose." I love that line, and whenever the problems of life in these messed up times get me down, I think on that. I know it sounds frivolous and flakey as an approach to life, but when you get over the fear of losing it all, it's actually quite liberating. I learned that the hard way, myself. Wow, this is awesomely written. Thank you. I have no health insurance and am unemployed at 56, in Michigan. No one will write me a policy--I'm uninsurable--but the state is in serious financial trouble and I can't qualify for Medicaid. COBRA would have run me $700+ per month--without a job. The last policy I had (The one that cost $700+ on COBRA) covered almost nothing. I had a $2500 deductible with 80/20 after that and an HSA. I still have the HSA. There is $46 in it right now. One trip to the ER with heart attack symptoms a year ago May left me with over $5,000 in out of pocket expenses AFTER the insurance paid what it would. I was there 36 hours and received no treatment plan--I was referred to a cardiologist who wanted a $600 deposit, which I didn't have. That was WITH insurance. Of course I never saw the cardiologist. For the ten years before I lost my job I watched my premiums rise and my benefits fall every year. When I first started as a CSR I had an HMO with a $10 co-pay. If anything cost anything, it was $10. That was a great plan. They went bankrupt the following year and I got a conventional 80/20 plan with a $100 deductible. After that the cost of the plan went up dramatically each year and the coverage decreased. The increasing costs always ate up our raises when we got them, so even though I was getting merit raises for good work my pay was steadily going down over a ten year period. For most of us it was like that. The company didn't care because they had an 'up and out' two-year management policy---move into a handful of management jobs or get out within two years. Then they started to cut the management jobs. People hung on way past two years because there was nothing else. They purposely set up shop in the most depressed towns they can find. You don't get the problem of unions that way. People are too scared to not be working. Right now my partner Bill earns most of the money but he had surgery October 12th with complications. He tried to go back to work November 2nd and had severe pain and was up all night. Now he is off work again and scheduled for more tests. He works 14-hour days as a truck driver and has a tube coming out of his side from the surgery because he isn't healing right. He worked like that Monday, for 14 hours. Even with paperwork from the surgeon and doctors and hospitals his job is now giving him grief. At six weeks (this is week four) the company will quit paying for his health insurance. He gets short term disability after two weeks but it is a fraction of his normal pay. Every day he worries about getting fired. He has been with this company 20 years and is four years away from early retirement (he wanted to work until his late sixties but that won't happen now), but this company is known for pushing out people who get sick or have someone sick in the family. So there is a real possibility they will find a reason to dump him any time here. We still don't know why he is not recovering. I can't even watch the health care debates on TV anymore. My life is a blur of money problems, health problems, and jobs I cant' get. In between I try to get freelance work but never seem to be able to carve out time to do it between all the doctors appointments. I don't know who we will pay the bills when they start coming. They will be enormous. Thank you for telling the truth, for taking the time to tell the truth. It's ironic that it took a Canadian to do it, but at this point, I'll take it. Thank you.